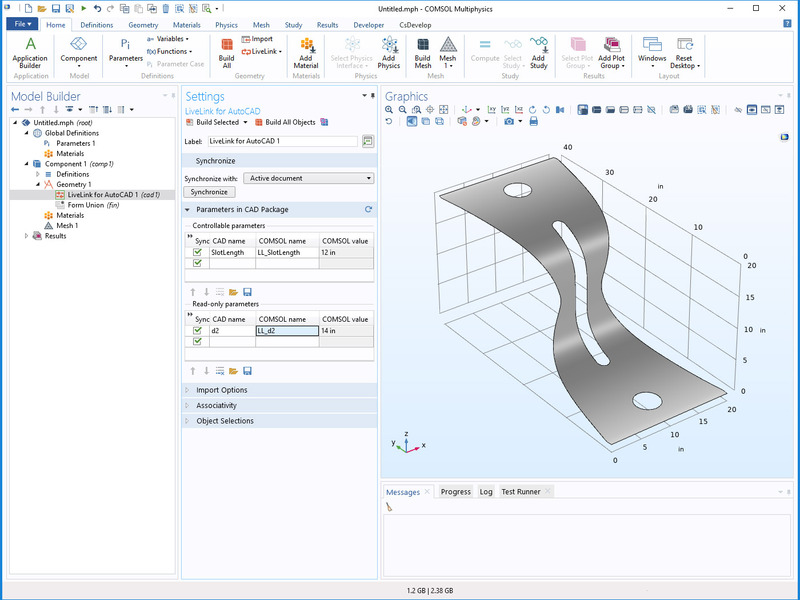 For users of LiveLink™ for AutoCAD®, COMSOL Multiphysics® software version 5.4 brings support for synchronizing read-only parameters and object selections generated for material selections. 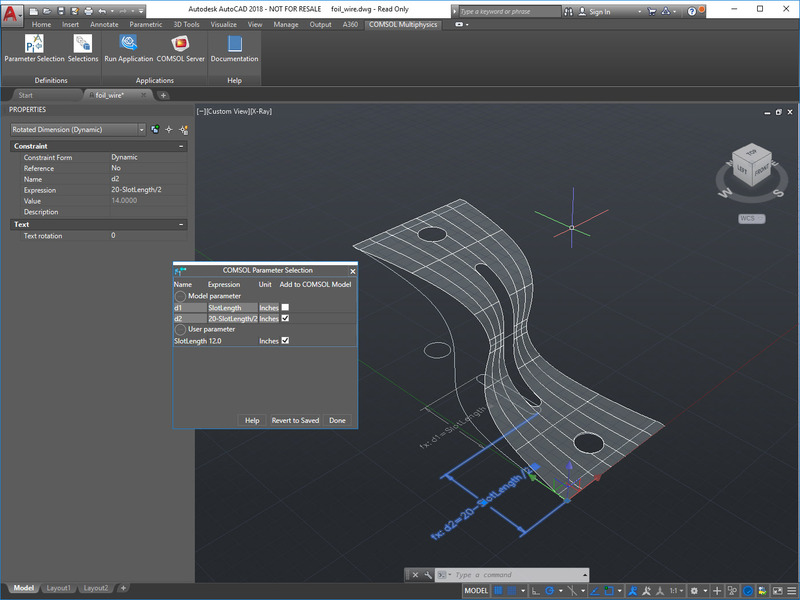 See the LiveLink™ for AutoCAD® updates in more detail below. Dimensional parameters that are controlled by an equation in the CAD model can now be transferred during synchronization. These parameters are treated as read-only parameters and are available for use in a COMSOL Multiphysics® model. The values of these parameters cannot be changed inside the model, but they are updated with each synchronization based on the changes in the CAD software. The d2 parameter is controlled by an equation in this AutoCAD® part file. After synchronization, the d2 parameter appears in the Read-only parameters table and the associated global parameter, LL_d2, can be used in the simulation setup. 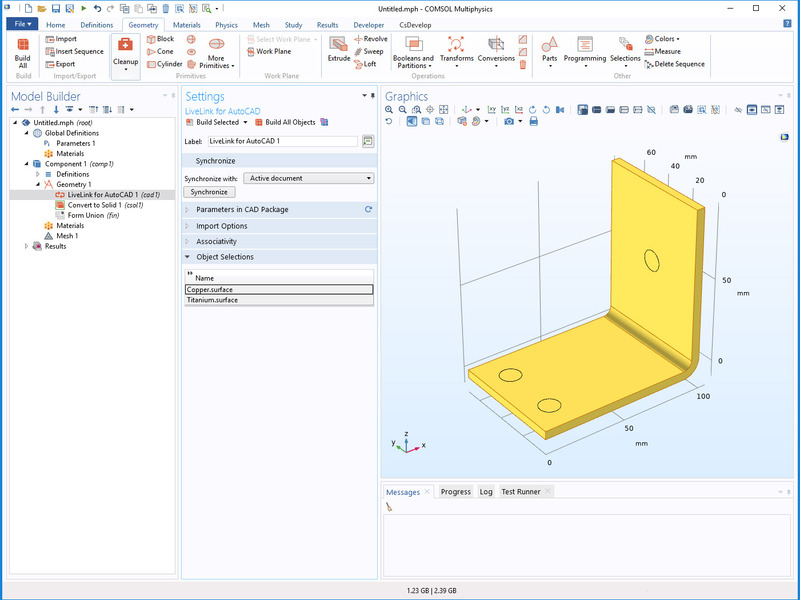 Material selections, which are generated from the material assignments in the CAD model, are now available as general object selections. These selections are available in the lists of input objects for the geometry feature nodes, below the LiveLink™ node in a geometry sequence. 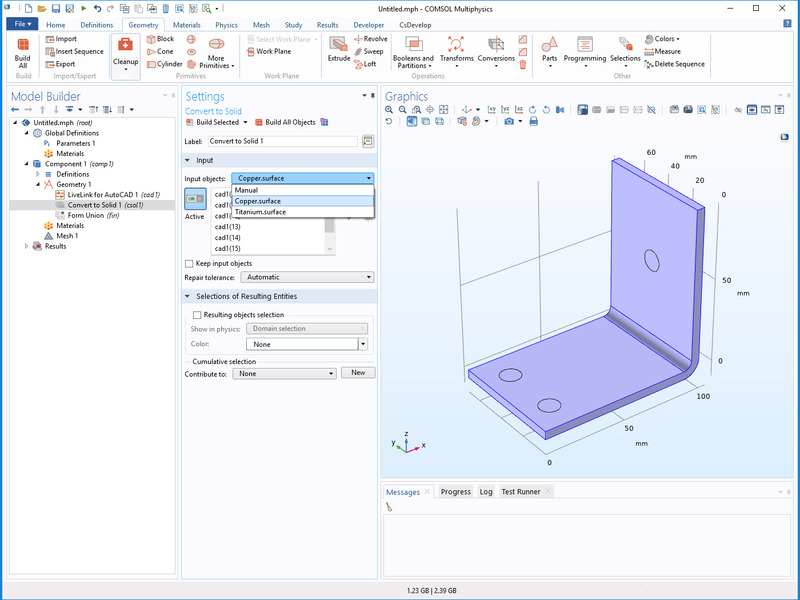 After synchronization, the Copper.surface material selection appears in the Object Selections section. The Copper.surface material selection can be accessed as input to the Convert to Solid 1 operation to form a solid of all surface objects that have been assigned the Copper material in the AutoCAD® file. Autodesk, the Autodesk logo, AutoCAD, and Inventor are registered trademarks or trademarks of Autodesk, Inc., and/or its subsidiaries and/or affiliates in the USA and/or other countries. Parasolid and NX are trademarks or registered trademarks of Siemens Product Lifecycle Management Software Inc. or its subsidiaries in the United States and in other countries. PTC, Creo, and Creo Parametric are trademarks or registered trademarks of PTC Inc. or its subsidiaries in the U.S. and in other countries. SOLIDWORKS is a registered trademark of Dassault Systèmes SolidWorks Corp. COMSOL AB and its subsidiaries and products are not affiliated with, endorsed by, sponsored by, or supported by these trademark owners.